With much of America preparing to go into another deep feeze as another polar vortex makes its way into the lower 48, bringing the Washington DC area its coldest December temperatures in over a decade, the globalists are still pushing 'global warming' while striving for global governance based upon that alone. And while Americans this week will be bundling up warmly and sitting by their fireplaces while our energy costs for December go through the roof, what we're experiencing here in December of 2016 is nothing compared to what Americans went through 200 years ago in 1816. 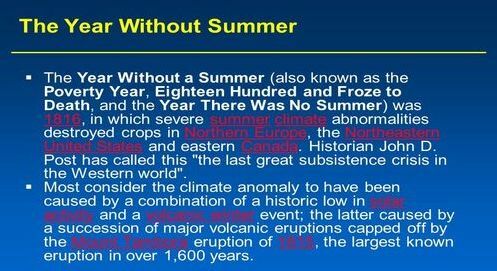 Known as 'the year without a summer', the extremely cold weather that brought disaster and despair to America that year was caused by a volcano nearly 10,000 miles away. Leading to countless deaths here in America and across the world that year, Wikipedia reports crops and animals died and the US economy tumbled as America was unable to produce enough food, leading to Americans fighting Americans in American streets for food. 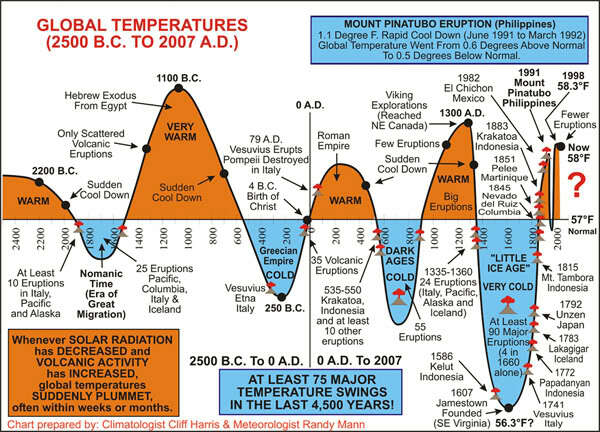 As we're told in the temperature chart below showing global temperatures spread out over more than 4,500 years, whenever solar radiation has decreased while volcanic activity has increased, global temperatures suddenly plummet - often within weeks or months according to experts. Is the cold weather that we're witnessing now here in America tied to the ongoing and unprecedented number of volcanoes that have been erupting across the planet this year? 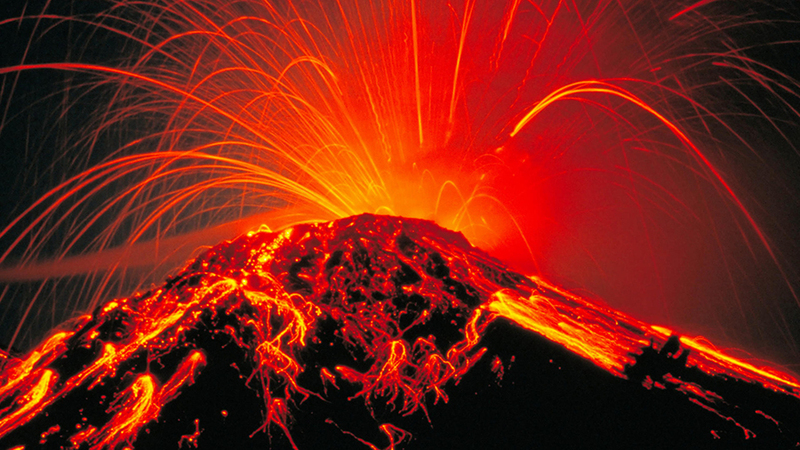 During the last week alone, Steve Quayle has linked to the following stories covering the unusual amount of volcanic activity and eruptions around the world recently. As we've reported on ANP several times this year, the extreme activity we're witnessing in volcanoes and earthquakes this year has been nearly unprecedented in recent history. On December 13th, Reuters reported a 'unique burst of activity' at a little-known volcanic complex near the border of Chile and Argentina has attracted the interest of international scientists and led worried govts to prepare for a potentially devastating eruption. Reporting that magma is exerting pressure on the Earth's crust in a zone where evidence indicates that explosive eruptions have happened repeatedly in the last few thousand years, though none in modern times, they report an uplift of nearly 7' in the last several years. If such an eruption were to happen at Maule today, it would have the potential to devastate nearby hydroelectric projects, and pump out ash that could wipe out crops across Argentina's pampas and severely disrupt global air traffic. "No-one has a seen a signal this large and this persistent. And it's in an area with an explosive record." On December 12th, the Express reported an 'eruption red alert' had been issued in Mexico with the Colima Volcano about to blow. While the volcano had been throwing ash and lava into the air since September, experts are now fearing the worst after a string of huge eruptions this past weekend, one of which threw ash about 3,000 feet into the air. More than 300,000 people live within 24 miles of the volcano the Express reports. Also on December 12th, the Seattle Times reported Mount St. Helens had been shaken 120 times within a week as the volcano 'recharges' according to scientists watching the tiny quakes, a mile to two miles below the surface. Calling it "a well-behaved volcano....as far as we can tell", Weston Thelen, a US Geological Survey seismologist says "each of these little earthquakes is a clue and a reminder we are marching toward an eruption someday." On December 9th, 10th and 11th, Strange Sounds reported on the many different volcanoes now erupting around the world in the last week alone including volcanoes in Costa Rica, Indonesia, Ecuador, Colombia, New Guinea, Hawaii, Peru, one of which caused a code red aviation alert for 7 hours after it ejected an ash cloud that was spotted by satellites more than 550 miles away. The Sabancaya volcano in Peru exploded 349 times in the last week alone. Back on February 24th of 2016, we reported on ANP about what happened in America and around the world back in 1816. Destined to be known through history as 'the poverty year', the massive volcanic eruption that happened in 1815 at Mount Tambora in Indonesia created conditions in America that turned into an agricultural disaster, with many Americans dying from poverty and freezing to death. And while we're not in the position at this moment to absolutely report that the freezing temperatures we're now getting across America could have been caused by the unprecedented number of volcanic eruptions half-a-world away, considering it has already happened in the past means its possible to happen in our present or in our futures. Imagine what might happen with all of the volcanic ash in the air, mixing with the already present geoengineering programs and chemtrails. As Susan Duclos reported Tuesday on ANP, the disaster that is Fukushima has already brought death to our oceans and now, the MSM has been forced to report upon it after neglecting it for years. Think about the combination of volcanic ash pillars coming down in the oceans, combining with Fukushima nuclear waste to fully change our oceans PH levels, leading to further catastrophe for our planet's oceans. At higher elevations, where farming was problematic in good years, the cooler climate did not quite support agriculture. In May 1816, frost killed off most crops in the higher elevations of Massachusetts, New Hampshire, and Vermont as well as upstate New York. On June 6, snow fell in Albany, New York, and Dennysville, Maine. Many commented on the phenomenon. Sarah Snell Bryant, of Cummington, Massachusetts, wrote in her diary, "Weather backward." At the Church Family of Shakers in upstate New York, near New Lebanon, Nicholas Bennet wrote in May 1816, "all was froze" and the hills were "barren like winter". Temperatures went below freezing almost every day in May. The ground froze solid on June 9. On June 12, the Shakers had to replant crops destroyed by the cold. On July 7, it was so cold, everything had stopped growing. The Berkshire Hills had frost again on August 23, as did much of the upper northeast. 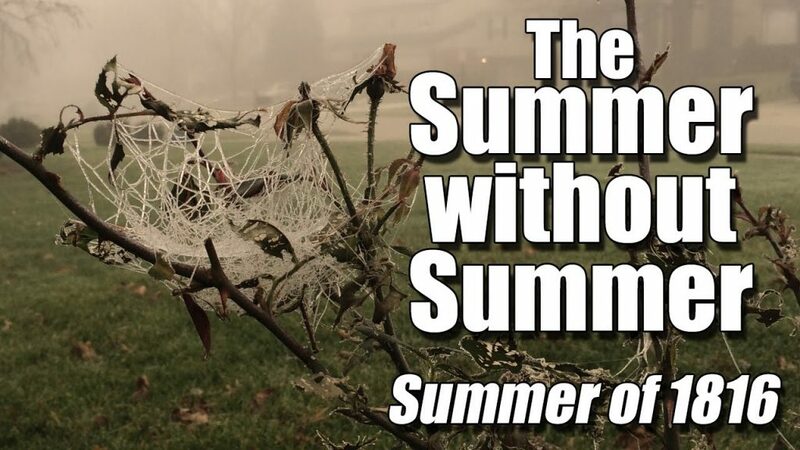 A Massachusetts historian summed up the disaster: Severe frosts occurred every month; June 7th and 8th snow fell, and it was so cold that crops were cut down, even freezing the roots. In the early Autumn when corn was in the milk it was so thoroughly frozen that it never ripened and was scarcely worth harvesting. Breadstuffs were scarce and prices high and the poorer class of people were often in straits for want of food. "All over the world, crops and animals died...People resorted to eating the unimaginable; straw, sawdust, moss...People went to war with each other over food...The effects were tragic...The US economy slowed because it was unable to produce food...Because of a limited food supply, inflation was present worldwide...It would take years for the global community to recover from the year without a summer." The 1st video below is from BBC Earth called 'power of the planet' and it takes a look at volcanoes and the role that they play in our climate and our health. 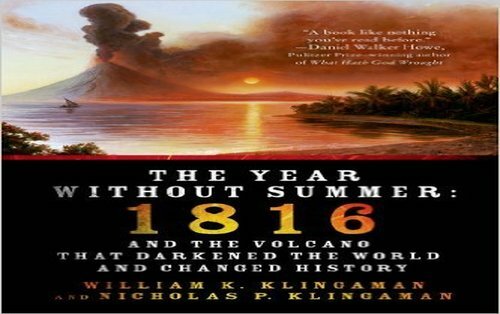 As the book cover seen above shows, in 1816, a volcano darkened the world and changed the course of history. Will they do so again? There is no doubt in our minds. The 2nd video below is a documentary that takes a look at what happened in America and the world back in 1816 after the eruptions of Mount Tambora. 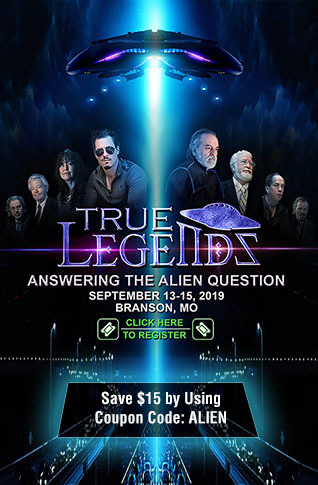 The final video below takes a look at all of the different signs that we've been witnessing across America and the world in recent weeks, including earth changes and other events, that leads our videographer to believe that we're now witnessing 'end times' unfolding across the world. With FEMA preparing for catastrophe here in America while government's across the world stock up on food, we too should prepare for something we pray never comes.